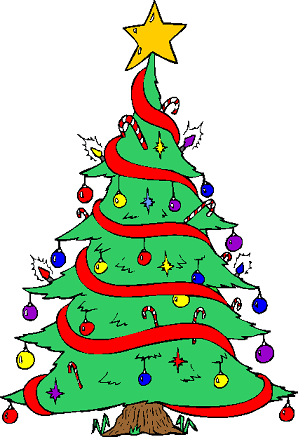 Christmas trees are a popular tradition associated with Christmas. An evergreen coniferous tree (such as pine, spruce or a fire) is covered with decorations and lights, and displayed. often in people's homes, places of work, and other locations. Additionally, in modern times, for reasons of practicality or convenience, it is also possible to get artificial Christmas trees, which more or less resemble real trees, although often in somewhat stylized form. When Christmas trees are used at home, it is a common custom for presents (sometimes including presents brought by Santa Claus) to be placed under the tree. Traditionally, Christmas trees were not set up until Christmas Eve (December 24th), and were taken down after Twelfth Night (January 6th). However, with the modern commercialization of Christmas, trees are usually set up earlier, particularly in shops (some shops set up their trees as early as October). Although it can not be proved, it is widely thought that the Christmas tree tradition has its roots in pre-Christian Yule traditions. It is known that in the 16th century Bremen (in Germany), a small fir tree was decorated with fruit, nuts, pretzels and paper flowers, and then erected in the guildhouse. In the following years, the custom of Christmas tree gradually spread. Eventually the custom spread to Austria, Russia and France. The Christmas tree was introduced to Britain by the German wife (Charlotte of Mecklenburg-Strelitz) of King George III. Today, the largest Christmas tree in Britain is erected each year in Trafalgar Square, London. This tree is sent from Norway, and commemorates British support for Norway during World War II (Norway was occupied by Germany from 1940 to 1945, and during this period Britain hosted the Norwegian government in exile, and assisted the Norwegian resistance movement).